The wooden bridge over the River Thames at Kew, from the Middlesex side. It was built in 1758-60 by John Barnard and had seven timber arches. 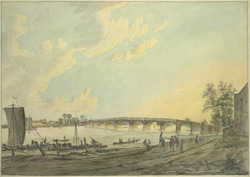 It was rebuilt as a stone toll bridge by James Paine in 1784-9.